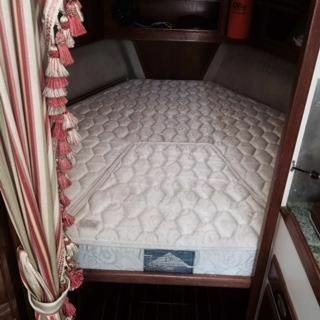 I was cruising through some Cape Dory 28 listings and came across this Mattress application. Does anyone recognize the Logo/Manufacturer?? Look up HMC mattress on Google. Not the same logo as in your photo. However, they've been around longer than boats! No affiliation. Are you just trying to identify it? Or are you looking to get a new mattress? We bought one from Handcrafted Mattress Company (HMC) several years ago and my bride still tells me how much she loves it. Not cheap but worth it to me, both for the Happy Bride AND my happy back. I did my own customization on a memory foam mattress from Costco. Cut down the length, width, and depth with an electric carving knife. I have considered doing something like that. How did the carving knife work? My wife doesn't like the mattress that came with the boat. Neither did the PO as they used a 3" memory foam pad over the top. I hate that pad, it shifts around, makes the bed hard to make, reduces head space above the mattress etc... A memory foam mattress OTOH, would be great. Look up HMC mattress on Google. We bought one from Handcrafted Mattress Company (HMC) several years ago and my bride still tells me how much she loves it. Not cheap but worth it to me, both for the Happy Bride AND my happy back. Thanks guys...They seem to get great reviews...Will continue to study the options.. I've done the same thing to make my own "custom mattress". Works great and saves a lot of money over a true custom. I also have to go with HMC, Steve. 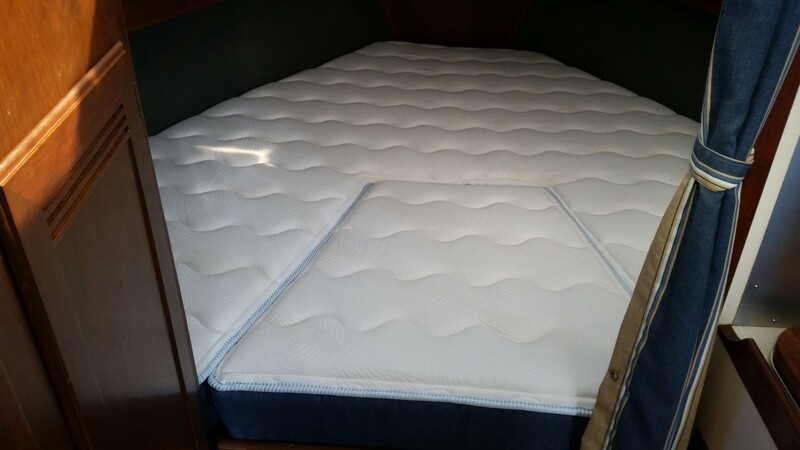 Our boat came with one already installed and it's the most comfortable mattress we've experienced, boat, home or RV. Ours is hinged in the center so it folds in half, and, one corner is rounded instead of square to take advantage of the shape of the hull in that area. If this one wears out, we'll buy a new one. Nothing better to spend your money on in a boat, outside of keeping the bottom watertight. Steve, check out these folks. Custom Mattresses Made By Comfort Custom Mattresses & Marine Bedding Inc. They are in Ft. Lauderdale, but will ship anywhere. They will make any type mattress you may want. I had them make a pocketed coil spring mattress similar to the Beauty Rest type. It is more comfortable that my bed at home. I am thinking of having them make mattresses for home and Airstream trailer. I sleep better on Moonstruck than anywhere. You can go to their show room and try the different types out. It's not a big place, but they make mattresses for some very expensive yachts. Cheaper than HCM, but still not cheap. Turns out that logo was from HMC. Elected to go with Portland Mattress makers and am VERY pleased with the result. They had my pattern on hand and the fit is perfect. Extremely comfortable as well. A huge improvement to the boat as we spend quite a few nights onboard..
Wifey B: Mattresses are of utmost importance. Some of these crappy mattresses that come on boats, you could hurt yourself when engaging in certain activities. Plus quality of sleep is very important too. We made the "mistake" in our home of ordering a custom mattress. It was like Since then we've had to have the same in the boats. Now ours aren't local but there are excellent mattress manufacturers in every area and most will do custom. Buying directly, no marketing, no branding, you get better quality for the same price. We didn't know about Comfort in Fort Lauderdale but we've encouraged others to go there for custom and they're very good. You get a good custom mattress on your boat and you'll be buying new for your home soon after. You'll also be talking to someone who knows their stuff. Seems like in the stores we're going to eventually end up with 50" thicknesses. Well, someone who knows what they're doing can do it at a reasonable thickness, which is very important in a boat.